One morning during our school’s holiday break, I awoke before dawn to the sound of my alarm. It was a dark Sunday morning, when most people are clinging to their pillows as long as possible – which is exactly what I would be doing if it weren’t for the fact that my number one chicken checker was out of town visiting family, and since there were few other volunteers around to take over for her, the job of letting the hens out rested squarely on my shoulders. As my bare feet touched the cold wood floors, my wife rolled over and immediately fell back asleep, as did our two cats who normally would spring to life at the first sign of movement, thinking it was breakfast time. It was too early even for their insatiable appetites. Drowsy and clumsy as I dressed in several winter layers, I felt a bit like the donut guy from those commercials in the 80’s. “Time to let the hens out”, I groaned silently to myself. At the farm I unlocked the gate with some effort, the padlock frozen and stubborn. Swinging the gate open plowed an arc of snow on the ground, so much snow that I had to lean my weight into the wrought iron to allow enough space to squeeze through. The chickens noticed the familiar commotion and began to cluck with anticipation from inside their hen house. Like many poultry cliché’s, being cooped up is a very real thing for them. The sun was just peeking over the neighbor’s rooftop and they knew it. Upon opening the little wooden hen house door, it struck me that the order in which the hens made their one-by-one exit was unusual. First down the ramp was Dot (a silver-laced wyandotte), then T-Rex (one of two Polish bantams with their funky Tina Turner-esque feathery crowns), then Lemonhead (a strong, confident exchequer leghorn), then Waffles (a blonde buff orpington who is a bit on the top heavy side, to put it kindly) and finally Nugget (the second of the two bantams, identical to T-Rex except that she’s a golden nuggety brown while her sister is black and white). I watched this procession with much interest because the order in which the hens made their exit was totally against their established pecking order. And let me tell you, the pecking order is far from just another poultry cliché. It is the social fabric that dictates nearly everything about their daily lives: who eats first, who decides where to sleep and when, and up until now, who gets to leave the coop first. Previous to this morning, either Lemonhead or Nugget (numbers one and two respectively) would have pushed their way to the front, followed by either T-Rex or Dot (numbers three and four), and finally dear old wobbly Waffles picking up the rear. If one bird ever decided to challenge a higher-ranking bird by cutting in line they did so with considerable risk to getting a sharp peck on their back, usually resulting in a lot of squawking and commotion. It was as if someone had picked up the hen house, shook it like a snow globe, and shuffled the whole pecking order – and none of the chickens seemed bothered in the very least. To really drive this point home, just a few weeks prior I was worried that Waffles wasn’t going to make it. At number five she was getting mercilessly bullied by T-Rex and Nugget who had made it their personal mission to torment her at every turn. 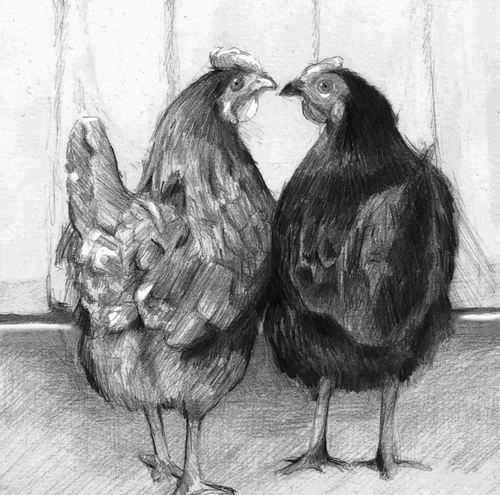 The bantams were of the same flock, and they were not exactly hospitable when we adopted the other three hens as adults (a practice that most chicken-raising books will warn readers against, as I would learn the hard way). Since they couldn’t pick on Lemonhead, who instantly asserted her dominance as Queen, and Dot was too quick for them, they turned their aggression toward the defenseless Waffles with a cruel precision that quite frankly creeped me out. They conspired, working in tandem to block her attempts to get food. They pecked her back so badly that she regularly bled, which is dangerous in that blood triggers the attacking bird’s instinct to go for the kill – to take the weak link out of the equation. As first aid I would spray the shivering Waffles with pungent anti-pecking spray (a mix of antiseptic and bee propolis which the lady at the feed store makes by hand according to her family’s tradition back in Romania), and would isolate Waffles until she could heal. Once I had even witnessed the gruesome twosome standing in front of the hen house door at bedtime (which for a chicken is always dusk), employing sleep deprivation tactics like some kind of masochistic captors. At this point I should say that prior to adopting the new flock of three, these two bantams – T-Rex and Nugget – were very much my beloved pets. I felt an affection for them not unlike I have for any cat or dog throughout my childhood. And yet all that endearment came crashing down the day I reached down to save Waffles from their violent attack and caught a hard peck on my hand by one of the bantams. In that instant their status changed from friend to livestock. The feeling of betrayal that I experienced was one of my first lessons in the Buddhist idea of non-attachment. The book Modern Buddhism by Geshe Kelsang Gyatso defines attachment as “a deluded mental factor that observes its contaminated object, regards it as a cause of happiness, and wishes for it”. I had been attached to the idea that T-Rex and Nugget were fair and compassionate, as silly as that may sound. I had anthropomorphized them to the point that I felt a real bond between us. I had been attached to a fantasy, which was very different from the truth. The truth is that these birds have been bred by humans for thousands of years (by some accounts since 6000 B.C. in Southern China) for one purpose: a reliable source of protein. After watching that morning’s procession in shuffled pecking order, I watched as the usually contentious feeding process turned downright cordial. My once adversarial chickens were pigging out beak-to-beak in near perfect harmony. What kind of bizarro scene is happening here? I wondered. I was then presented with the next lesson in Buddhist thought. Playing on the radio while driving home was an interview with two Buddhist teachers, Sharon Salzberg and Robert Thurman. The topic of discussion, as if on cue, was loving your enemies. And so even if you win one round in one life over one enemy, then you have become like that enemy by being violent, angry, whatever it may be, and then your rebirth will become something more appropriate to an inner state of anger and violence and hatred and, therefore, you’ll be more in conflict with your environment and with others. So, therefore, to love the enemy is highly rational from your own inner perspective in that sense. And actually in the outer perspective, if you take the definition of love as wishing for the happiness of the beloved, which is the Buddhist definition of it, then if your enemy was really happy, he or she might get tired of bothering to be your enemy. Like why bother chasing that guy? You know, I’m having a groovy time somewhere else. So in a way, it kind of makes sense to wish the enemy to be happy. Had these hens sensed something similar to what Robert Thurman was teaching? Something more basic and primal than our intellectual understanding can account for? I would like to think that despite all of their overly simplified “bird brain” behavior, chickens do possess an awareness of their own place in the cycle of endless lifetimes. I would like to think that chickens understand the karmic implications of their actions in this life, and would prefer not to enter the next life as the lowly rats that incessantly steal their food at night. More likely though, these chickens simply lost the will to make a big drama of everything knowing that in the end no one bird will starve and everyone will have a place to roost. In my heart I knew that behind all the congeniality of that morning, the pecking order would rear its ugly head if push came to shove. For now at least, the girls were exercising a very Buddhist idea of choice. In this moment, choosing peace. Tagged chickens, geshe kelsang gyatso, robert thurman, sharon salzberg.